A little over 5 years ago, I created a post about outlining and how to build in Minecraft on a "1 meter to 1 block" scale. 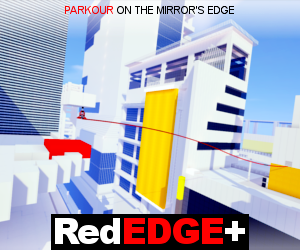 In this series, I really kept things basic teaching only how to build at a 90 degree angle. I kept this simple because the algorithm to create scale builds on a unique angle can get sloppy and might be too difficult to do at first run. My goal with each tutorial I make has always been ease of use and the ability to pick up what my point is within minutes. I'm now thrilled to say we have made our outlining tool public and want to share it with the world! Go to MCParks.Us/Outline to check out the tool! Pick a point in your Minecraft world to act as your reference point (we like to use the center of Magic Kingdom's hub on our map). This point will be used to derive other points. Set the measurement unit to meters, and find the real life location of your reference point, and use that as the first point on the ruler. Leaving that first dot on Google Earth, move the mouse (stretching the yellow line) to a spot of where you want to get the point of (this could be a corner of a building or whatever) and click, this is your second point and you should have a yellow line on Google Earth. Remember, you will only be pivoting the second end of the line while keeping your first start point the same throughout. Look at the measurement box, and take note of the "Map Length" and "Heading" fields. Copy these into the "Length" and "Heading" text boxes on this page. 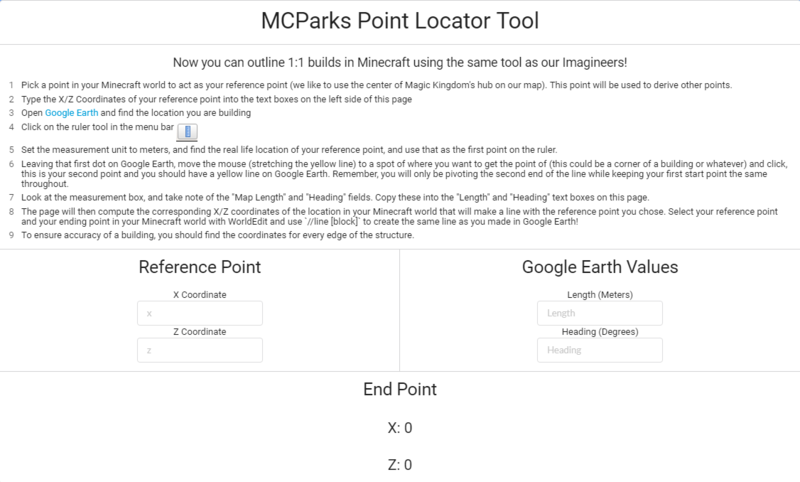 The page will then compute the corresponding X/Z coordinates of the location in your Minecraft world that will make a line with the reference point you chose. Select your reference point and your ending point in your Minecraft world with WorldEdit and use `//line [block]` to create the same line as you made in Google Earth! TIP: To ensure accuracy of a building, you should find the coordinates for every edge of the structure. This tool was developed by our plugin development team who work tirelessly alongside our project to create and develop theme parks built to scale in Minecraft. We are publishing this content to everyone and phasing out our computer application for this tool because we feel as though it is best within the hands of the community and we are excited to see what everyone will make in the future! While this development is free for the public, it would be silly to not mention the project this was made for. If you have a minute, connect to Main.MCParks.Us on Minecraft and check out all of our work over the previous almost 6 years.